I truly believe you should "Do what you love; love what you do!". I hope Design Improvised becomes a place where you can be inspired to do what you love! My Insanely Awesome DIY Outdoor Rug! How to Host a Freezer Meal Exchange Party – with Wine! Last year, my friend Amanda invited me to join her “Frozen Supper Club.” I had never heard of such a thing, but after trying it out once I was hooked! Whether it is called a freezer meal exchange, a dinner swap, or a frozen supper club, the idea is the same: get together with a group of girlfriends over apps and drinks, and head home with a freezer full of meals for your family. What is not to like about that?! 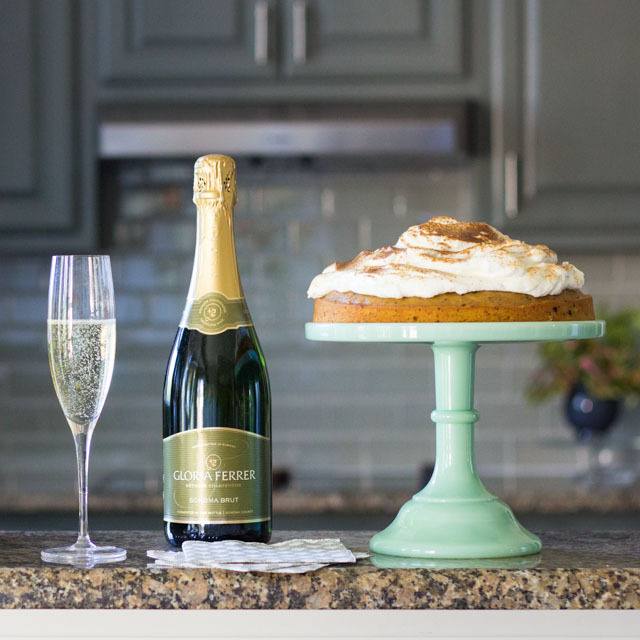 Today I’ve partnered with Gloria Ferrer wines, the first sparkling wine house in Sonoma Carneros, to share my tips for starting your own freezer meal exchange club and show how I hosted our last monthly meet-up, where the Gloria Ferrer sparkling wine was the featured drink of the evening! Read on for my 8 tips for starting a freezer meal exchange! 1. Find 4 or so friends who like to cook The frozen supper club is perfect for those of us who enjoy cooking, but want a break every so often! The ideal size for the club is 4-6 people. Once a month you each cook up a freezer-friendly entree in bulk to exchange, and then you come home with 3-5 different meals for your freezer – score! Having a couple back-up meals in the freezer has come in handy so many times for us, such as on nights when my husband was traveling and I didn’t want to cook, or we had after-school activities and I just needed to pop something in the oven when we got home. 2. Start a Facebook group for your club Having a Facebook group for our club has been helpful for selecting a date to meet each month, as well as sharing the dishes we plan to make in advance to avoid having two people make the same thing. It also provides a helpful record of what meals we have made in case we need some inspiration, and is a good place to share links to recipes! 4. Prepare and label food with reheating instructions Once you’ve prepared your food you’ll want to divide it up evenly in to-go containers. 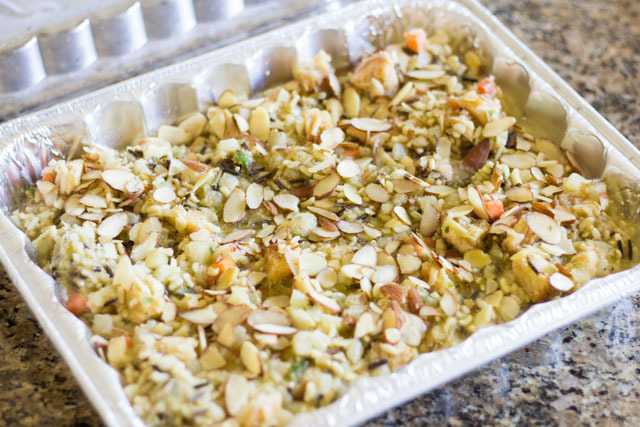 Aluminum trays work particularly well for dishes that are to be reheated in the oven, while plastic containers or ziplock bags work well for soups and crockpot meals. 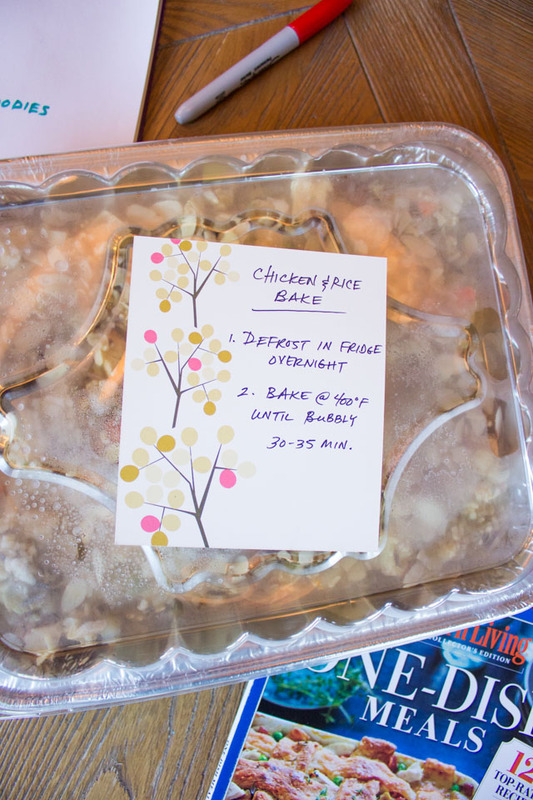 Labeling the outside of the container with the name of the dish and instructions for defrosting and reheating the dish are key! 5. Provide any extra fixings for your dish Depending on the dish you make, you may want to provide some extra fixings to accompany it. For instance if you do brisket, you’ll want to include a package of buns. If you make a curry you may want to include a bag of rice. 6. Pack your coolers The night of the exchange, fill a cooler with your dishes to transport them to the host’s house and keep them cold! 7. 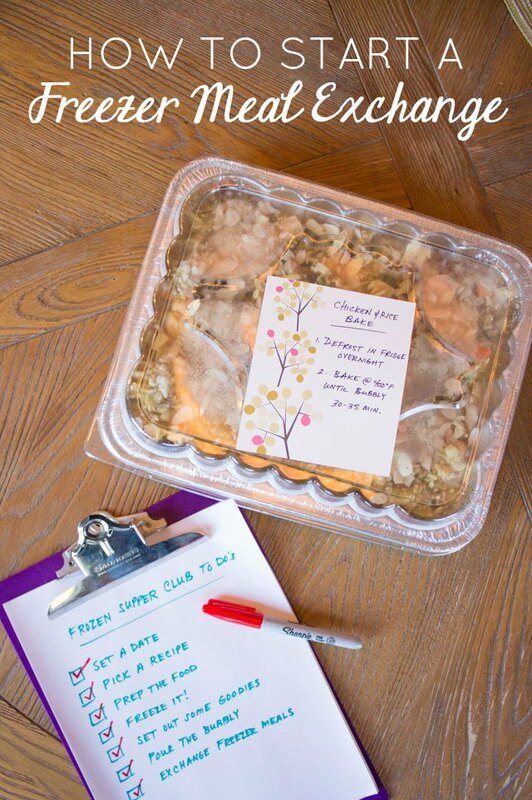 Take turns hosting For our club, we typically meet on a weeknight at one of our homes. We let the husbands get the kids to bed, and we enjoy a mommy’s night out! It is important to note that the actual food exchange happens the last five minutes of the evening. The first two hours are conversation over some yummy treats and drinks! 🙂 Hosts keep it simple with an appetizer or a dessert and a special wine or cocktail. 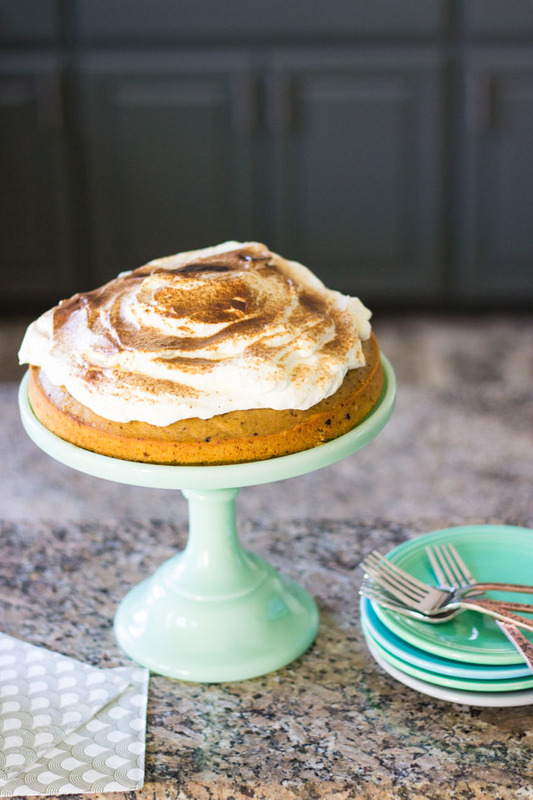 I made this pumpkin spice latte cake for our November meet-up. It was delicious and paired perfectly with the Gloria Ferrer sparkling wine. It looks complicated but it super easy to make (the top is just whipped cream dusted with espresso powder – yum!). Store bought treats are also always a great option. 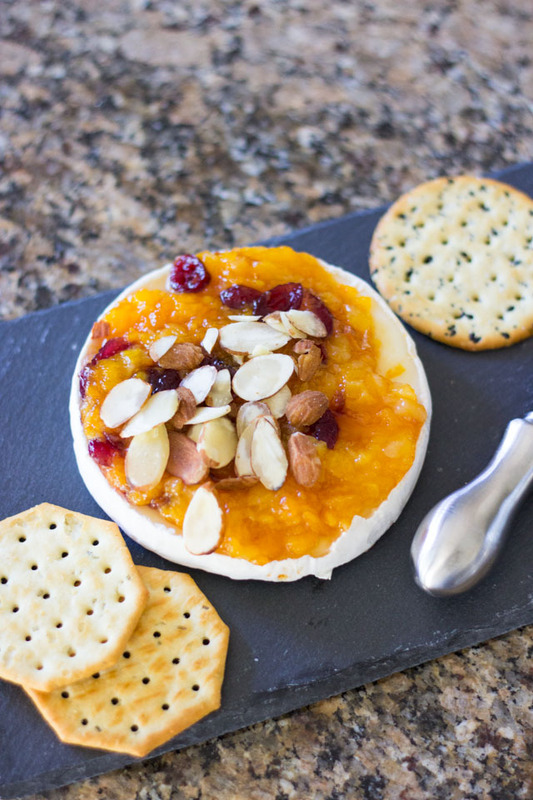 I found this yummy brie with fruit preserves at the grocery store! 8. Pour the wine! I saved the most important step for last. You can’t have a frozen supper club without wine. 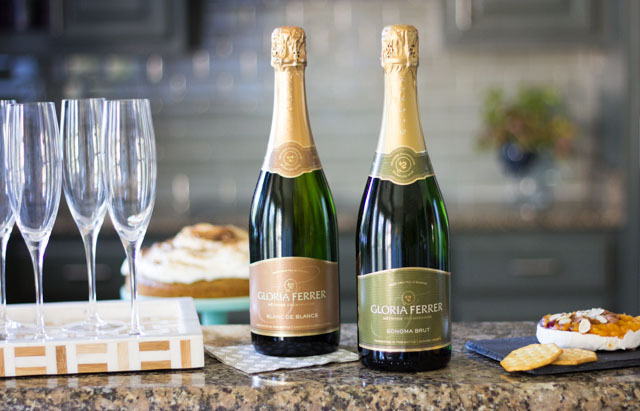 🙂 I love a good sparkling wine like Gloria Ferrer as it just seems to instantly make an event seems special, even if it is just a weeknight gathering of moms. Gloria Ferrer wines have earned over 500 gold medals and 50 90+ scores in the last 5 years! 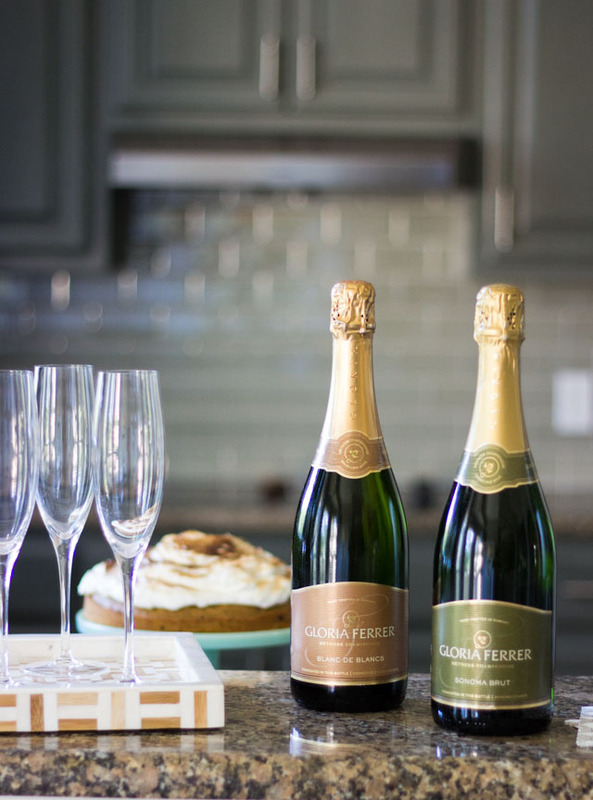 Gloria Ferrer Caves & Vineyards is Carneros’ original sparkling wine house, owned and founded by the Ferrer family of Spain. Named for José Ferrer’s wife, Gloria, the winery opened in 1986. Thirty years later, with 335 acres under vine, the estate vineyards at Gloria Ferrer is known as experts in the production of Pinot Noir and Chardonnay, and produce estate grown still and sparkling wines that rival some of the world’s finest. I was selected for this opportunity as a member of CLEVER and the content and opinions expressed here are all my own. Love Week: I Want to Send You A Valentine! The latest Design Improvised projects delivered straight to your inbox!